Greg Russell & Ciaran Algar perform at Shoreham’s Ropetackle on April 25 on the back of a new album (ropetacklecentre.co.uk). Spokeswoman Jane Brace said: “Still only 24 and 22, Greg and Ciaran released their first album The Queen’s Lover in 2012 when both still at school and enjoyed a rise as rapid as a bullet train when just six months later they landed the Young Folk Award at the 2013 BBC Radio 2 Folk Awards. “In 2014, they found themselves at the Royal Albert Hall clinching the Horizon Award for Best Emerging Act and in 2015 they were nominated for Best Duo. “Drawing on a range of influences, their intuitive musical rapport increasingly in evidence, Russell and Algar released their second album The Call in 2014 and, in 2016, the acclaimed The Silent Majority. 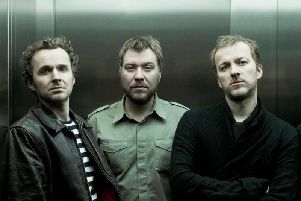 “Now with solo albums under their belts (Greg’s Inclined to be Red and Ciaran’s The Final Waltz) and performances in other line-ups (most notably Algar with Sam Kelly & The Lost Boys and Russell in The Transports and his own multi-artist protest song project Shake the Chains), they are back with an assured fourth studio album. “Utopia and Wasteland marks another milestone in their short but exceptional career. “Recorded at The Green Room Studio, Devon, there’s a significant leap in sound and production values courtesy of prolific producer Mark Tucker who also adds percussion, bass and backing vocals to Greg’s unmistakable voice and acoustic guitar and Ciaran’s fiddle, tenor banjo, electric tenor guitar, bodhran and vocals.